Remember on Monday when I said I was going to introduce something new to my blog? Well, here it is: How to De-Seed a Pomegranate. OK, so how to de-seed a pomegranate is hardly new, but this is a video of me de-seeding a pomegranate, which is new frontier for this Food Blogga. Some of you are panicking right now, thinking, "Oh, great. Now I have to watch her chop vegetables every week just so I can leave a comment on her blog." Fear not, friends, you will not be tortured. 1. The videos will be short. I know you don't want to watch an 18 minute video of me peeling and slicing butternut squash. So you won't. 2. I'll keep them useful yet light in tone. I'm thinking of adopting a mockney accent like Jamie Oliver (actually I love Jamie, accent and all). 3. I don't have Giada's budget, kitchen, or film crew, but I do have a kind-hearted, savvy husband who is willing to give up a few hours on the weekend to be both my film and editing crew. Already he has suggested I dress like Giada. He's so insightful. Thanks, Jeff. OK, here we go -- Put on your 3-D glasses and watch the pomegranate come right at you! Once you've de-seeded your pomegranate, you need to make cookies. Why pomegranate seeds in cookies? Why not? Their tartness is the perfect foil to sweet chocolate and rich pecans. 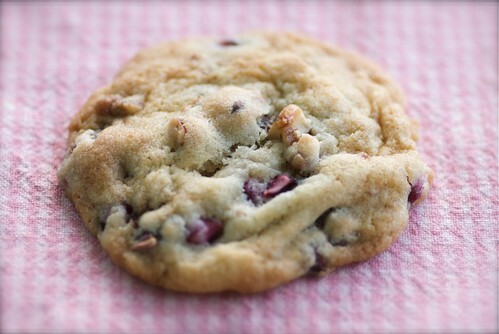 Plus it just sounds cool: Double Chocolate Pomegranate Cookies. 1. Preheat the oven to 375 degrees F and center a baking rack. Line two baking sheets with parchment paper. 2. In a large bowl, beat butter and sugars; beat in the eggs and vanilla extract until smooth. Mix flour, baking soda, and salt in a small bowl; add to the large bowl, and beat until just combined. Stir in the chocolate chips, pomegranate seeds, and pecans. 3. Drop 2 tablespoons of cookie dough 2 inches apart (as they will spread) on the parchment-lined baking sheets. 4. Bake cookies for 11-13 minutes, or until firm and golden brown around the edges. Transfer to a rack and cool for 15 minutes. To store cookies, layer between pieces of waxed paper to prevent sticking and place in an air-tight container. Properly stored, cookies should last up to a week. Note: Feel free to use all dark chocolate chips instead of white or to substitute pistachios for the pecans. Also, you can make smaller cookies if you prefer. But, really, why would you want to do that? I think this is great! I can really use this in my classroom. Thanks! I didn't even know we could make cookies with pomegranate. Looks yumm. Very cool! You look beautiful, Susan! I had no clue how to do this... thanks and I look forward to more of your vids! That is some amazing finger action in the middle - you look like "The Bionic Food Blogga!" :-) Can't wait to hear the one with the accent! THANK YOU!!!! That video was just what I needed!!! I think you did a beautiful job with the video Susan. You're a natural. So cool! I can handle two minutes. I'm going to try a pomegranate this year. Definitely adding it to my list! I love the idea of little videos like this since I learn best by seeing it. I will be making those cookies just as soon as I can find some good pomegranates here in TN and then shipping a tin to my dietician SIL who will LOVE the chocolate, nut, pom. combination! I didn't know it was that easy! Great and simple video. OK, that was brilliant on so many levels---I mean a white shirt and a pomegranate on video!!? Wow. I am impressed. I have ruined many a shirt while eating a pomegranate, so I can't wait to try this out. Also, it was great to see you in person! The recipe looks amazing too--I've only ever eaten pomegranates raw, so I'll have to give it a try. Love the video, and keeping that white shirt white is impressive! You go girl! :))) I do enjoyed the video! Great video - you are too cute. And yummy-looking cookies! You are just adorable, Susan - loved the video! 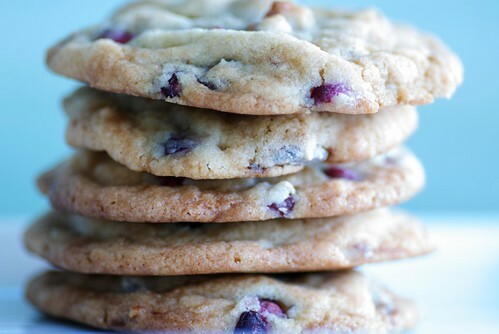 These cookies are wonderful - what a great idea to add pomegranate seeds too cookies. Yum! What a joy it is to see you and your sweet personality on your blog! This is great, Susan. Keep it up. Hi! I've never thought of making cookies using pomegranate. Wow! This is one of the top three "how to" tips ever (cubing a mango and deseeding an avocado are my other two)! I have a pomegranate tree in my backyard and had no idea how to get the seeds from the fruit...thank you so much! I love the underwater seeding method! And, these cookies sound fantastic. How healthy, too! Pomegrantes and chocolate!! Can't wait to try this, and thanks for making it so easy! Never thought about putting pomegranite seeds in cookies. Thank you! So, recently bought my first pom and had some in couscous and now this......I think I'll have to try them with white chocolate!!!!!!!! Lovely! Have a blessed 2010! wonderful, now I'll have a clean shirt and my baby can have tons of this wonderful fruit - she just loves it. and I love the necklace! I love videos! Makes it so much easier to understand, and much simpler than instructions seem. teachercooks-Wonderful! I hope your students like it! karen-Oh, thank you so much! TW-You didn't know I had that bionic skill, did ya? vanillastrawberry-Yes! And farmers tell me the cracked ones are the ripest and most flavorful too. val-That's sweet of you to say. beck-That's great to hear, actually. Feedback is always helpful. nicole-I'm so happy you enjoyed it. Now you can wear your white shirt while eating poms without a worry in the world. paula-The cookies are really great. lydia-It helps illustrate the point! patricia-I hope you try them as I know you love to bake with unusual ingredients. christine-You always leave such thoughtful comments. Thank you. zakka-Well, I hope you give it a whirl now! Thanks too! elizabeth-Yay! That makes me so happy! Mangoes and avocados are good ones too. lisa-I'm glad you like it! claude-olivier-Nice to find you too. Thanks! kitchen butterfly-Your first pom? That's so exciting! Really. You're going to love them. that is such an adorable video! i love the idea of pomegranate in biscuits. simply adore them. Cute video! And I love the combination of chocolate and pomegranate - yum! I love pomegranates, but I'd never thought to make a cookie out of them before. I'll have to give it a go. Thanks for posting. Also - you write for NPR right?...I'll be on On Point in two weeks! Very excited! How did you get involved with them? Susan you are awesome! Way to go live---I am so proud of you! Okay next up will you slice up an artichoke for me;)? Fresh pomegranates in cookies - how awesome. My daughter eats one whole pomegranate at one sitting! I do not get much opportunity to do much with the fruit! But for cookies she will spare some I am sure. Just the other day I thought to myself, what can I do that's different with these pomegranate seeds? My boyfriend said, bake cookies, and I laughed at him. Now, I will make these and pray to god he doesn't remember that incident so I can claim they were my idea. Thank you!!! I just made the cookies, and I love them. Thanks!